Unlike existing sources and power supplies that can only simulate a battery under one specific condition, the new Keithley 2281S battery simulator from Tektronix, offers the industry's first emulation of battery performance from full charge to total discharge using a battery model that includes state of charge, amp-hour capacity, equivalent series resistance, and open circuit voltage. 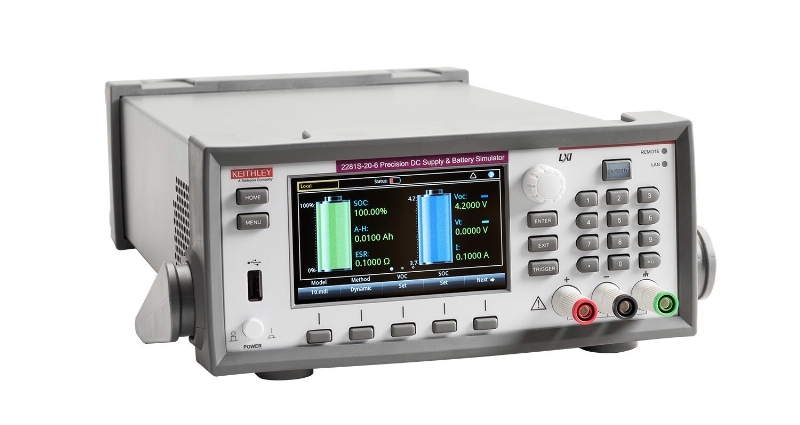 Tektronix, Inc., a leading worldwide provider of test, measurement and monitoring instrumentation, has announced availability of the Keithley 2281S Battery Simulator and Precision DC Power Supply. Unlike existing sources and power supplies that can only simulate a battery under one specific condition, the new Keithley battery simulator offers the industry's first emulation of battery performance from full charge to total discharge using a battery model that includes state of charge, amp-hour capacity, equivalent series resistance, and open circuit voltage. Maximizing battery performance is a critical design goal for any battery powered device from smartphones to Internet of Things (IoT) products. A battery simulator enables design engineers to understand the load current drawn by a device in all operating states and how quickly the battery capacity declines. This is much more challenging than ever before due to the growth in wireless devices that draw very complex load currents. A battery simulator such as the 2281S that can dynamically emulate a battery is essential for a thorough, accurate study of device operating time between battery charges or replacement. "The 2281S revolutionizes the way designers characterize and evaluate device performance at all stages of a battery's discharge cycle," said Mike Flaherty, general manager, Keithley product line at Tektronix. "It represents the industry's first "dynamic" battery simulator and eliminates the need for using different types of real batteries during performance testing, which greatly reduces test times and improves accuracy and flexibility. What's more, it includes a high-performance DC power supply, making the 2281S a tremendous value and a must have tool for any designer working on a battery powered device." Battery models that are simulated or played back by the 2281S can be obtained in a number of ways. One method is to use the instrument's battery test function to perform a full test on a battery intended for a particular design. After the test, a battery model can be generated based on the measurement results of the battery charging process. Battery models can be edited, created, imported, or exported in a convenient CSV file format. Alternatively, a battery model can be created according to a battery's chemistry and the manufacturer's specifications. In contrast to battery simulators intended for manufacturing applications, the 2281S incorporates a bright, 4.3-inch TFT display that shows voltage, current, amp-hour readings, source settings, and many additional settings in large, easy-to read characters. An icon-based main menu provides fast access to source setup, measurement setup, display formats, trigger options, and system settings. Adding to its value on the bench, the 2281S also functions as a high performance power supply with a maximum output of 20V and 6A. It delivers class-leading measurement accuracies of 0.02% for voltage and 0.05% for current. Resolution of current measurements is as low as 10nA to measure very low sleep mode currents. Headquartered in Beaverton, Oregon, Tektronix delivers innovative, precise and easy-to-operate test, measurement and monitoring solutions that solve problems, unlock insights and drive discovery. Tektronix has been at the forefront of the digital age for over 65 years. Join us on the journey of innovation at www.tektronix.com. In 2010, Keithley Instruments joined Tektronix as part of its test and measurement portfolio. 0 comments on "Tektronix Unveils Innovative Keithley 2281S Battery Simulator/Precision DC Power Supply to Shorten Design and Test Cycles for Mobile Devices"